Cindy Ayala, an ESOL 4 student, has been elected as an “ESOL Representative” in Blair’s Student Government Association (SGA) this year. 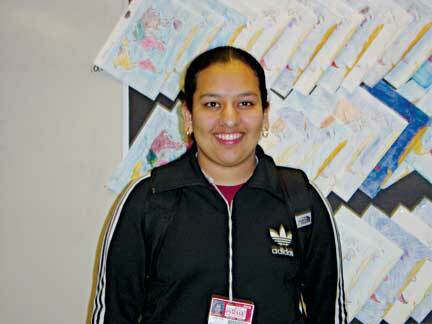 She hopes that through this job she can help ESOL students to be treated fairly. “I’m excited to help other people. I can do it,” Cindy said. At first Cindy was a little nervous about all of this work but now she says that she will be fine. “I feel comfortable in this position,” Cindy said. Cindy believes that one of the main reasons why ESOL students do not participate in our school activities is because of their language problem (English). But this year Cindy will take the challenge in her hands to work very closely with the ESOL students and make some differences. “I will do everything possible to achieve it,” said Cindy. This is a new position in the student Government Association. Barun Aryal, the president of Student Government, thought about creating this position in the summer. Christie Lin, a member of the SGA, worked with Ms. Tomesek to organize the ESOL election. Ms. Tomesek also believes that Cindy is a great person and will definitely work hard in this program with the SGA team. “Absolutely, she is a really good person,” Ms. Tomesek said.